My name is Brad Andrew. I’m a Brisbane based Building Designer and Draftsman with over a decade experience in the industry. I have a passion for all things creative, particularly Architecture and Design. I create functional building design solutions for clients who want a 1 on 1, hassle free client experience. I focus on functional modern design principles tailored to the needs of my clients. I only work on projects that I believe I am a great fit for, so that I may be of most value to the people I work with. With a 1 on 1 service you won’t be dragged down with the tiring admin processes larger firms can hide behind. 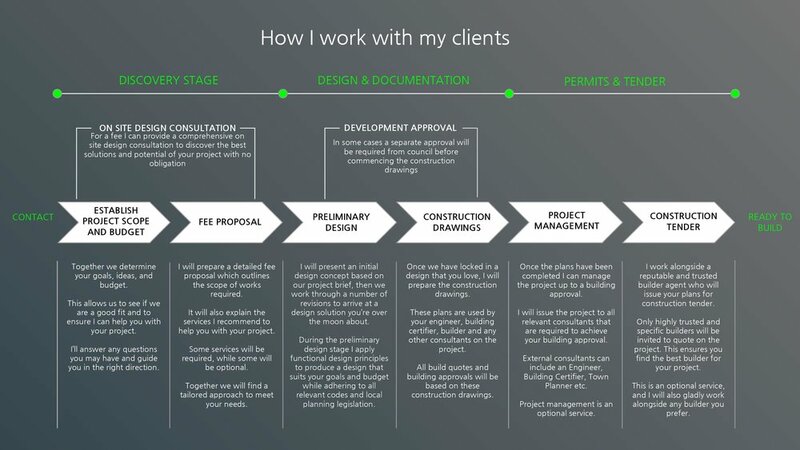 I promise that engaging with me will produce a custom outcome, a clear concise project flow, and expert guidance throughout the whole process, from concept to construction. I am mobile so I work everywhere and I’ll come to you. I don’t do quick plan alterations or drafting fixes, as this is not my passion. I am however, very happy to recommend someone who will. I Provide Concept Design, Construction Drawings and Project Management services for Residential Projects Including Renovations, Additions and New Builds. With Years of experience as a Building Designer and Draftsman I will work with you 1 on 1 every step of the way to ensure a tailored approach, anchored in functional design principles while producing a building that addresses your lifestyle and needs. I will tailor a Building Design and Drawing Package that serves your Budget and Goals Best. I Provide Concept Design, Construction Drawings and Project Management services for Multi - Res Projects including Multi Unit Developments, Townhouses, Terrace Housing and Granny Flats. I will guide you through the Planning and DA process with comprehensive Site analysis, Feasibility Studies , DA Drawings and Construction Drawings while liaising with all required consultants to ensure a smooth and viable solution for your property. I can also provide investment reports and market analysis to provide detailed information on your estimated development returns in the current market so you know your on the right track. I Provide Concept Designs and Working Drawings for Commercial Projects Including Restaurants, Bars, Cafes and More. I believe a functional commercial design should be anchored in the needs of you as a client, but also the needs your future customers and the environment you wish to create for them. With a focus on Functional Design Principles, adhering to all relevant Council and Building Code Standards I will produce a Design that creates the Customer Experience you desire while ensuring an outcome that can be approved and open for business. The Building Design and Construction Process can seem like a long and winding road with enough advice and information to make your head spin. I am a Building Designer with a passion for all things creative, particularly Architecture and Music. If I’m not working on projects I care about, you’ll find me at the beach, drinking too much coffee or playing my guitar. I have qualifications in Architectural Studies, Design and Construction. .
My Career started in Melbourne working as a Building Designer and Draftsman where I learned to focus on functional design solutions and client relationships. My path lead me to specialise in residential, multi-res and hospitality projects. These are the projects I seek so that I may provide the most value to the people I work with ensuring a great working relationship and a Building Design Solution my clients are over the moon about. I am a fully Registered and Insured Building Designer with the Queensland Building and Construction Commission. I am not an Architect, and my fees reflect this. I really hope to hear from you soon, and look forward to seeing how I can help you achieve your goals for a better Building Solution and ultimately a better lifestyle or space. Send me a quick message below with some details and a brief description of your project. I’ll be in touch within 1 business day to discuss your project goals in more depth to find the best solution and services to help you.